The Tacoma chapter of Jewish Voice for Peace is currently hosting an exhibit of Historic Boycott Posters at Urban Grace, the downtown church in Tacoma (now through next Thursday, July 16). It wasn't until we unpacked the crate of posters that we knew the specific ones we would be exhibiting, and I am wowed by what we have brought here. As we took them out of the case and began hanging them (they're in a particular order and are hung that way), words coming out of our mouths included, "Oh, I have this at home as a postcard!" (2 times) and "Whoa, this is SO applicable -- so 'right on' for today," and "I have a t-shirt of this Taco Bell boycott poster" (farm workers' ultra-low wages, working conditions, and lack of benefits). The exhibit includes 58 posters from boycotts over the past 60+ years, beginning with the Montgomery Bus Boycott and going up to today's boycotts, including Monsanto, Coca Cola, and Israeli goods and all corporations that profit from the Israeli occupation of Palestine. Arizona (SB 1070 targeting immigrants and encouraging racial profiling). There were some posters about boycotts that had gone under my radar, including a boycott on Guatemalan tourism to protest the military dictatorship and more than 200,000 Guatemalans who were killed or disappeared during the civil war. Mitsubishi was the focus of yet another unfamiliar one, for their destruction of rainforests in Bolivia, Brazil, Canada, Chile, Indonesia, Malaysia, Papua New Guinea, the Philippines, and Siberia (whoa: they got around!). "Posters from the campaign challenging South African apartheid and the movement opposing the Israeli military occupation of Palestine make up the largest sections of this exhibition. They represent the longest continuous international boycott movements—campaigns that have generated many posters throughout the world. Both of these boycotts also created intense controversy. The campaign against South African apartheid is a reced­ing memory, and it may be hard to imagine the strong emotions, broken friendships, and divided families that resulted from this campaign. However, the impassioned divisions around the campaign to end the occupation of Palestine are a clear reminder of the tensions and conflict that economic activism can provoke." Beverly Naidus of the University of Washington, Tacoma, art faculty spoke at the opening reception on July 2. She said that when she first walked in, she was stunned and happy to see the artwork of several people she knows, including Ricardo Levins Morales - 4 posters in the exhibit, Doug Minkler - 2 posters, and Lincoln Cushing - 1 poster. Read more about Beverly Naidus' work. While making her presentation, Naidus asked those assembled what posters they liked best, and why. Responses showed different people's tastes: one person liked the "No GMO/Monsanto Must Go" poster because there were few words, the graphics were explicitly clear (a skeletal hand holding an ear of corn, with international warning symbols of nuclear radiation and "acute toxicity"), while another person liked the ones that weren't immediately obvious but required some thought. Another liked the ones with perspective that drew her in, and yet another liked the ones with human faces. This is such a varied show that I expect most people will find a number of posters that they like. In addition, it's about putting our money where our mouths are, and what better venue for such consideration than in the midst of some incredible images? 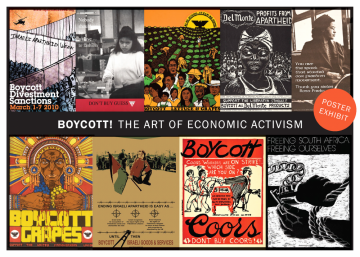 I invite you to attend this exhibit of boycott art at Urban Grace Church, 902 Market St, Tacoma, Washington, 98402. The days are Tuesdays and Thursdays from noon to 6 p.m. and Friday through Sunday from 1 p.m. to 5 p.m. from July 2 to July 16. (EXCEPT on Saturday, July 11 it runs from 2:00 to 5:00 p.m.) I predict you will be energized, as I was.